The roads in and out of the village where closed down yesterday, and all the lifts are closed today due to high avalanche danger. "There was rumours of snow coming in, but we have virtually been covered in snow in the past 24 hours" says Eric Spongberg at Ski Lodge Engelberg. "It is total chaos here, with plows running back and forth trying to clear the streets and the avalanche bombs thundering in the background. " 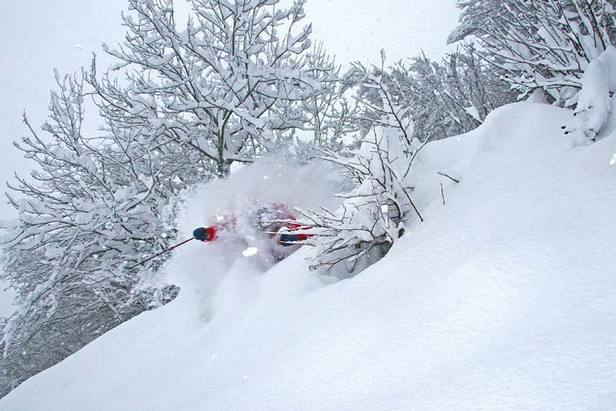 "The snowpack has been looking thin lately, but this definitely means a white christmas in Engelberg". The ski area is planned to open tommorrow, December 2, again with some sun expected. "It might be one of those days tomorrow, I just might need to skip a couple of hours of work." Ski Lodge Engelberg is a mountain lodge in Switzerland. We focus on good food, great wines, boutique-y rooms and service. We are all ex-freeriders who know what makes a really good mountain holiday.